Please visit our Online Pharmacy to order medicine for your pets. Use our EPet Health App to receive information about your pets. Pet Emergency? Call us right away at (706) 324-0619! Our mission at Cataula Veterinary Hospital is to offer the best veterinary care we can to our community with accurate information and honest answers. Our practice is built around our core values of honesty, integrity, hard work, team work, compassion, honest direct communication and most of all treating you like we would like to be treated. We strive to let these values guide us is in all that we do as we seek to meet your pet care needs. We know that we are not perfect, but we hold these values as our goal. We believe in preventative health care and firmly think that prevention is always better than cure. We recommend a through health exam at least yearly. Along with this we recommend regular testing for parasites, preventative medications for heartworm, fleas, ticks, and worms as well as vaccinations including core vaccines and others as needed according to your pets lifestyle. When your pet is getting older we include more in depth yearly testing to be sure the internal organs are functioning normally. If problems are detected treatment can be started early. Our goal is for every pet to be healthy, happy and live a long life. If your pet needs surgery you can be assured that we are as careful with your pet as we would be with our own. We recognize that there is always risk when anesthesia is used and work hard to minimize that risk. Presurgical lab screening and radiography are used to be as sure as possible that anesthesia will be safe. Each patient is monitored using modern equipment and an attendant for the duration of every procedure. When your pet is sick we will give your pet a thorough exam using up to date diagnostic tools and our best efforts. If the diagnosis is not readily evident we will do our best to find out what is wrong. This often involves more diagnostic testing and sometimes referral to a specialist. We do our best to offer the best treatment plan for your pet. We know that each situation is different and will do our best to find the option that is best for your pet, you and your family. If you are new in our community or just need to find a veterinarian we would love for you to make an appointment to come in and meet us. We would love the opportunity to partner with you in caring for your pet. Cataula Veterinary Hospital, P.C. is proud to offer modern equipment and custom designed facility for best care of your Pet! Click for a tour! We are excited to offer ePet Health service to manage your pet's health online. Let us know if you would like to set up an account. Click the boxes above to access your account. Dr. Blackmar grew up in the community of Cataula attending school in Harris County. He graduated from Auburn University with a Bachelors degree in Chemistry. In 1983 he graduated from University of Georgia Veterinary College. He worked in three different practices in Georgia before returning to Harris County to establish Cataula Veterinary Hospital, P.C. in 1990. 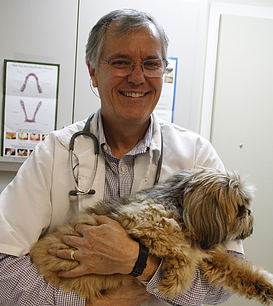 He practices all areas of small animal medicine and surgery with an emphasis on general and orthopedic surgery. His personal life centers around his family and home. He enjoys his own pets, gardening and almost any outdoor activity. Dr. Graves attended University of Georgia College of Veterinary Medicine. She is a native of Cataula, is the daughter of Dr Blackmar, and grew up in the Blackmar family practice. She is the proud mom of a Border Collie 'Mulligan' and grey tabby cat 'Ryoko'. Since opening the clinic in 1990 Debby has managed the running of the hospital. She works hard to ensure that the clinic runs smoothly for the benefit of the pets and their owners. She ensures that bills are accurate and that the clinic provides a competitive service for the community. "We have used Dr. Blackmar for 23 years, we love him! He has been there for us through surgery for one of our dogs, and all the care our several pets have needed. We highly recommend them 😀"
"The friendliest and most helpful staff! I would recommend them to anyone. Dr. Graves was fantastic." "Great place for all your pet health needs! Dr. Blackmar and his team are great and friendly."